Are you rolling your eyes at the mention of avocado toast four ways? I hate when trends ruin a good thing. Like beards! Whether you’re a beefy lumberjack, a science teacher, or a just someone who wants to sport a beard, you should be able to do so without being referred to as an autoharp-playing coffee house hipster. Same goes for brunch, and more specifically, avocado toast. Y’all. I will defend avocado toast to the end because it is so much more than a photo op. (But obviously still a photo op.) Aside from being incredibly Instagram worthy, avo toast offers itself as an awesome heart-healthy option by inviting so many other healthy goodies along, and this is why we need to embrace it as the toast with the most. Avocados are packed with GOOD FATS. (There’s something wildly satisfying in saying the words “good” and “fat” in the same sentence.) Good fats, also known as monounsaturated fats, lower cholesterol and reduce the risk for heart disease. Avocados also have anti-inflammatory effects which prevent chronic inflammation—and they’re high in fiber! So so so many good things. Here are a few of my favorite ways to turn toast into a colorful and wholesome avocado-smeared masterpiece. Avocado Toast With Smoked Salmon, Cucumber, Soy Sauce, and Sesame Seeds. This one is my absolute favorite—no questions about it. It’s hearty, healthy, and the flavors are crave-worthy. You get a creamy richness from the avocado, a refreshing crispness from the cucumbers, a hint of sweet smokiness from the salmon, and a punch of salty umami from the soy sauce. So many flavors I love from the sushi bar get a nod in this one. Avocado Toast With Arugula, Sea Salt, and Lemon. When my sister-in-law visited back in June, most of our conversations revolved around blogging (she runs a bookish blog over at pickingbooks.com, check it out!) and food. She couldn’t stop gushing over her latest obsession: arugula salad drizzled with fresh lemon juice. So for breakfast one morning, I whipped us up avocado toasts with just that—and it was a total hit. A fresh spritz of lemon goes perfectly with the peppery-ness of arugula and a pinch of sea (or kosher) salt. Avocado Toast With Soft-Boiled Egg, Tomatoes, Chili, and Lime. This avocado toast will fill you up and make you feel good. You can improvise with the cook of the egg—a poached egg works really well! The tomatoes add some welcomed freshness, and the chili and lime bring on big flavors. Avocado Toast With Radishes, Honey, and Cracked Black Pepper. I’m all about adding honey to savory bites lately. Earlier this summer, I indulged in a pizza that came with a honey drizzle and holy moly, was it ever delicious. It’s pretty evident that I used watermelon radishes here, but any radishes will work. Just slice them up thin, top them with avocado slices, drizzle some honey over top, and finish things off with a few cracks of black pepper. As you can see, the avocado toast train isn’t a bad things to be on. This breakfast option does have a purpose and is so much more than just an Instagram moment. But I mean, I do encourage you to ‘gram your avocado toasts. They’re gorgeous by default. 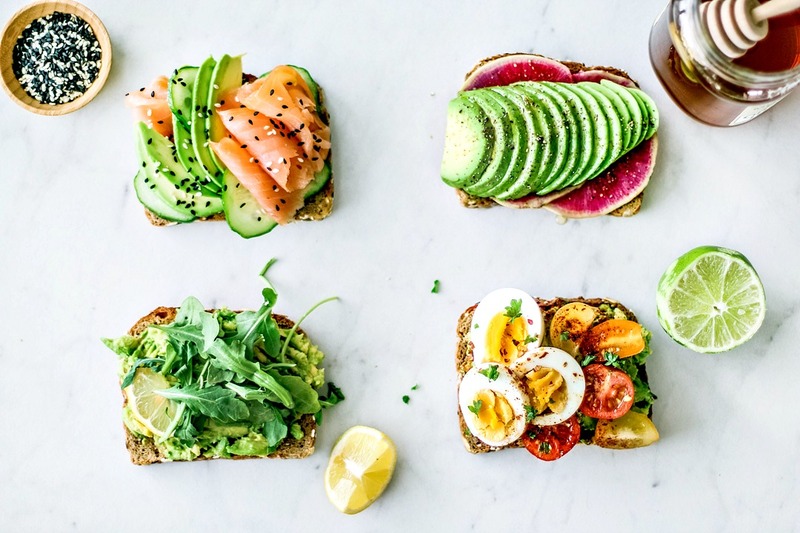 Have your Avocado Toast Four Ways: Smoked salmon, cucumber, soy sauce, and sesame seeds; arugula, sea salt, and lemon; soft-boiled egg, tomatoes, chili, and lime; radishes, honey, and cracked pepper. 1 soft-boiled egg feel free to cook you egg differently; a poached or fried egg works just as well. Toast the bread to your preference. Layer it with avocado, sliced cucumbers, and smoked salmon. Drizzle a bit of soy sauce over top and garnish with sesame seeds. Toast the bread to your preference. Layer it with avocado, then add a pinch of salt. Drop a nice handful of arugula over the toast and finish it off with a spritz of lemon juice. Place an egg in a small saucepan and add enough water to just cover the egg. Place over moderate heat and bring the water to a simmer. Once the water is simmering, set a timer for 4-5 minutes. When done, drain the egg and run cool water over it to stop the cooking process. Carefully peel the egg, slice it into several slices, and set it aside. Toast the bread to your preference. Layer it with avocado, tomatoes, and egg slices. Sprinkle chili powder and chili flakes over top, and finish it off with a spritz of lime juice. Toast the bread to your preference. Layer it with radishes and avocado slices in whichever order you prefer. Drizzle honey over top, and finish it off with a few cracks of black pepper. I have to admit I haven't jumped on the avocado toast bandwagon yet. We reserve our avocados for our salad every evening. But now that I see your toast and variations, I think we should break out of our paradigm and use the avocados for breakfast -- at least once in a while. I don't know which one I'll try first -- they all look so good. What absolutely gorgeous photos, Dana! When I first saw them, I thought, ooh, I'd go for the smoked salmon and cucumber one first (huge smoked salmon fan over here). Now, reading all of the descriptions again, I absolutely cannot make up my mind, because they all sound amazing! You've taken avocado toast to a whole new level here. I love when "good for you" is so simply stunning! Thanks, Amanda! I'm obsessed with smoked salmon. When I buy it, I eat it daily until it's gone. So that particular toast is definitely the most popular choice in this house. But they each have something to offer in their own way, for sure. Let me know if you make any of them! Trend or not...I am in! Each and every variation has me salivating. So perfect for entertaining. Really gorgeous photography, too. Looks so good. Will definitely be making all 4 of these!! Thanks, Kris! I hope you love them. Let me know! I can’t get enough avocado toasts and I don’t care what anyone says! I absolutely love the arugula idea, as I’m such a huge fan. I’m usually a hard boiled egg with everything bagel seasoning but you throwing the lime with the egg is changing the game! Can’t wait to try it that way! Arugula is so good with lemon! I'm also really digging the idea of a boiled egg with 'Everything Bagel' seasoning WHICH I *JUST* bought from Trader Joe's yesterday and I cannot WAIT to sprinkle it over everything! I love avocado in general, but it's so amazing on toast! The most I've ever added on top of my avocado toast was fresh tomatoes, but I'm anxious to try the with soft-boiled egg, chili, and lime. If I had a lime on hand, it would be tomorrow's breakfast for sure. Yes! Fresh sliced tomatoes with a hit of salt and pepper is another way I like to go! (Usually with cukes as well, because gosh, cukes are so damn refreshing). Let me know which one you end up loving most! I usually score my watermelon radishes from Whole Foods. They've had them here consistently since spring, which is great because last year they vanished pretty quickly. Not related but have you seen the glitter beard trend? Insane! Anyways, I LOVE avocado toast! I've had a whole bag of avocados go ripe on me all at once this week and I've been eating it every day! Right now I'm just smashing them up, mixing with lemon, and topping with chili flakes and a sunny side up egg. I'm getting a little bored of it so I'm so glad you posted this because now I'll have a new avocado toast idea for tomorrow morning! HAHA—I did see a post about glitter beards at some point last year, I think. I figured the whole thing was in jest, but you never know. And girl. I have an entire bag of about-to-be-ripe avos in my fridge RIGHT NOW. Looking forward to the same kind of week you had ;) I love your quick and simple idea. I'm totally going to try that! I hope you enjoy these ones. The possibilities with avo toast really seem endless. Avocado toast is awesome. I can eat it for breakfast, lunch and dinner. So many delicious toppings to add. You just gotta love when recipes are healthy, delicious and so easy to make. YES! Avocado toast is my jam. bah hahha... see what I did there? Sorry - newborn at home, I'm operating on E these days ;) I LOVE these combos especially the soft boiled egg chili and lime! Wow! NICE ONE TRACY! I'm a pun lover myself, so you're in good company here. Haha. YUM! Each and every one of these looks delicious.